British Gas' Hive smart thermostat system has been somewhat of a success, with the company amassing 250,000 customers in the UK in the two years since its launch. If this was a Silicon Valley based start up rather than an annex of a UK gas company owned by a global corporation, it would be sure to attract a mind-boggling price tag. But the company isn't content with just heating Britain. Last month it revealed a new suite of smart home products powered by its own Honeycomb platform it acquired from AlertMe, and is has its sights set on a US launch. It already has its own US business – Direct Energy – and the company says it has all the ingredients to give Nest and Google a big run for their money. 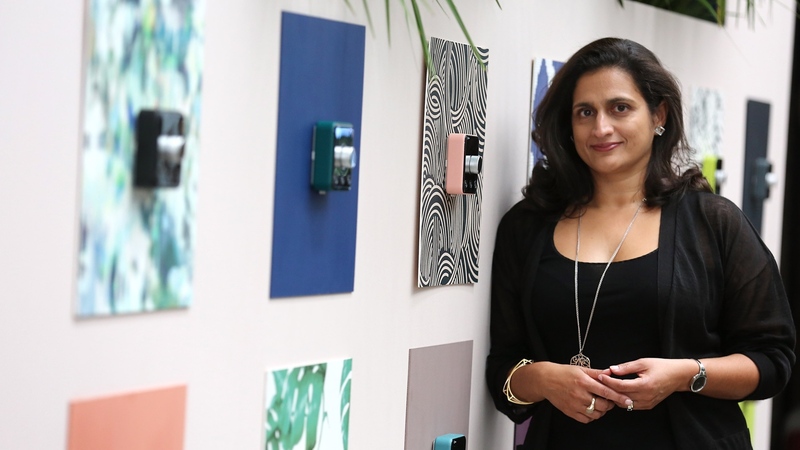 Nina Bhatia set up British Gas' Connected Homes division back in 2012 with 15 people. She was given carte blanche to hire whoever she needed to make it a success. Three years later, she manages 200 staff. Nina and I first met at the launch of the original Hive in 2013 at a low-key event in London. Few would have expected such success from a company known more for bills on the doorstep than internet of things innovation –especially when competing with the likes of Nest. However, Nest has struggled to replicate its success on this side of the Atlantic (although it does now have a deal with British Gas rival Npower) and British Gas has taken full advantage. Bhatia believes that while Nest has made waves among tech early adopters, the millions of 'normal' users are still mystified by the technology. "Yes, there's an early adopter community that's willing to deal with technicalities, but if you're going to build a really big business you have to take it beyond early adopters, and that segment of the market needs a bit more handholding," she told Wareable from the Connected Homes HQ in Central London. While the rest of the tech industry is still grappling with the smart home as an idea, British Gas are already steaming ahead with plans to expand beyond smart heating and into home monitoring, lighting and automation. "We have a vision for the Hive family that will address all parts of the home but the things we're starting with is door sensors, pressure sensors, monitoring and lighting," said Bhatia. "Those will be coming out later this year, and it's about the ecosystem they create." And the company means business. Not only has it released an updated version of its Hive smart thermostat, it roped in Silicon Valley's star designer Yves Behar to do the creative work. Bhatia was responsible for getting Behar on-board, and admitted that beyond wanting the best man for the job, the company has an eye on the US market. "It was a very deliberate decision to get someone who is well respected in tech and design. We are building a business that goes beyond the UK so we need to future-proof what we're doing." That would take British Gas a long way from its core business, but Bhatia says that its parent company, Centrica, sees the smart home as a huge part of its future. The company recently posted poor financial results in the face of falling wholesale energy prices, and its move into the smart home globally is one of its top priorities. "Connected Homes is one of our top three priorities globally. We have something like 30 million customers in homes across the world, so yes this absolutely is a definitive and deliberate move into the home more broadly," she said. "It isn't as much as a leap as you imagine as customers invite us into their homes already. They give us permission to address these areas, and its not a big leap in their minds," she added. "We have a big business in the US called Direct Energy, which is a significant player," Bhatia explains. "We have an energy business, a services business, so just as in the UK we have got a platform: we have the product capability, we have the installation capability and the after sale capability, which is important in this market." This is where British Gas believes it has a significant advantage over any of its competitors. It's trusted to go into people's homes to install their equipment, and help all kinds of users get started with the system. And Bhatia believes that this relationship with people is key to achieving huge scale. "We have a collection of advantages. We have a world class platform and product development capabilities that has started here. But we can easily develop new predicts. Some will translate and some won't. I think we're in a great position because we have the assets I described." Bhatia believes that with its energy business in the US, it can replicate its success in the UK. And the advantage of being trusted to go into people's houses and install the devices is a huge benefit over the likes of Nest. "I knew being in the home was an advantage but even I didn't realise how much of an advantage it was. We have a tiny return rate." "I think it's really actually early days, and there a lot of players, some very big and very tech led who are in this space. Clearly HomeKit, Brillo, Nest, Google (or Alphabet) and a bunch of smaller players. Then there are a lot of people with interests in this space like us," she said. "This is a category that will develop to accommodate more than two or three big players. Homes are different, especially in different countries, and that's a very important insight. We're going to have to operate in a number of local markets. That might take a family of products and they will need adaptation." But are there plans to make sure Hive works with Google and Apple's platforms? While most startups would bend over backwards to get involved with those giant players, Bhatia cooled any expectations, and told us the company was more focused on making products than worrying about platforms. "We never rule anything out but the smart home is too nascent to make definitive statement. We will have an open platform because we want a broad range of services," she said. "You have to start with products that change their lives, and develop services people love to use and get attached to, everything else will follow. I'm less worried about which platform, and more concerned with are we creating the right kind of products for people. We will let the platform dynamics take care of themselves." Nest was bought by Google when it had around 1 million customers. Hive has a quarter of that, but the potential to tap into millions of homes worldwide. I put it to Bhatia whether she's considered the potential value of the company she's created, if it was based in Silicon Valley. "The thought has occurred to me. It's a good question. Actually, we have 250k customers with Hive, and we have 1.5 million customers with smart meters. That's a very interesting install base."